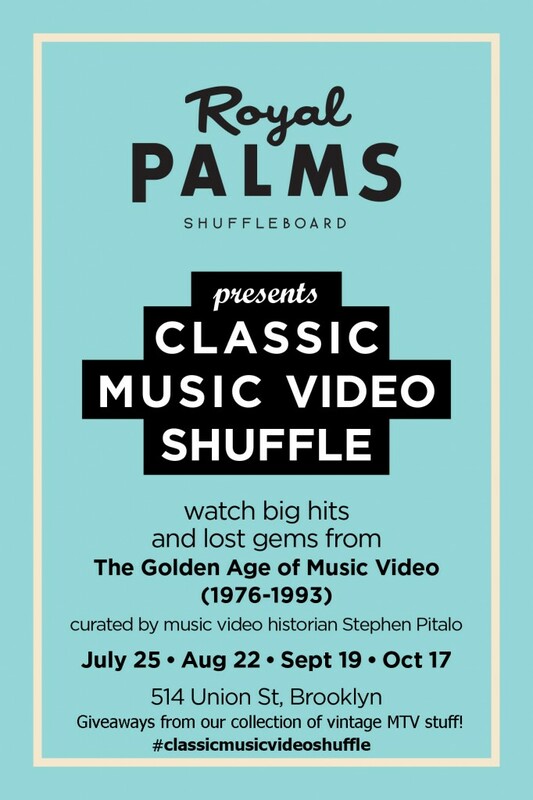 We are back, bringing classic music videos to Brooklyn’s hottest spot, the Royal Palms Shuffleboard Club, but what’s new? Well, we’re starting earlier. We hit the screen at 8:30pm. It’s MTV like you remember it – one great music video after another! VJ Stephen Pitalo curates a three-hour music video block from THE GOLDEN AGE OF MUSIC VIDEO (1976-1993), full of big hits and forgotten gems – from ABC to Zebra! We’re also giving away cool stuff – pinback buttons, heavy metal trading cards, and vintage MTV shirts! With 10 shuffleboard courts, Floridian cocktails, live music & a rotating cast of food trucks, The Royal Palms Shuffleboard Club keeps Brooklyn tropical & festive all year long. You have to see this place to believe it! We’re giving away great vintage MTV stuff as always, so come see us, tweet up & get cool prizes!